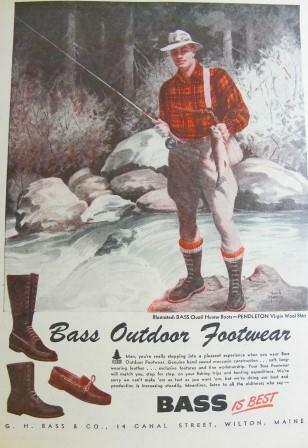 The image of a fisherman used by Bass Footwear in the late 1940s is that of a rugged outdoorsman; a guy who looks like he belongs on a rock in the middle of a stream, holding a rather nice brook trout he might just cook up, streamside, as soon as he hops to shore. He’s got the boots to do it in, too. Leaving the issue of his trousers aside, all in all he’s quite a specimen. 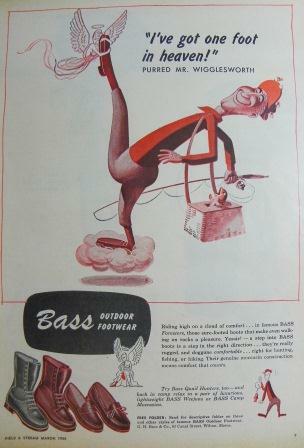 Within just a few short years, though, a new kind of outdoorsman was emerging and Bass replaced the man who hopped rocks amid torrents, wearing jodhpurs with tall wool socks rolled over the tops of his boots, with a man who, instead of hopping, evidently pranced.